6. Your dream last night? ??? Kerri you are the SWEETEST thank you soooo much!!! Hugs! Thanks so much Kerri, you are such a thoughtful gal. You deserve it girl! Loved reading more aboutchya...and I hope your youngest starts to get well soon! 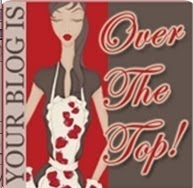 Well I have to admit that your blog is totally over the top awesome! Thank you so much for the award, Kerri! It's a big honor for me!